Mariners Latest: Welcome To The Mariners Stephen Pryor! 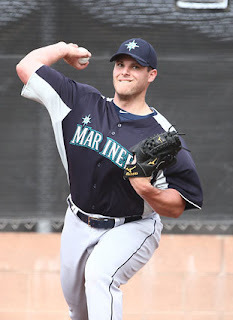 Welcome To The Mariners Stephen Pryor! Stephen Pryor has made some quick work in the minor leagues. After just leaving Jacksonville for Tacoma on May 7th. Now, less than a month later he will join the Major League 25 man roster and get his shot for his Major League debut. Pryor was selected in the 5th round of the 2010 First Year Players Draft and started this season with the Jackson Generals. Jackson was equipped with just about every top pitching prospect that the M's had, including Taijuan Walker, James Paxton and Danny Hultzen. Pryor was the first one to fly the coop and head for Tacoma. George Sherrill was placed on the 60 day DL to make room for Pryor on the roster. Pryor had a 1.13 ERA in 16 innings pitched for Jackson and in Tacoma he held a 0.00 ERA in 12 innings. That's a big reason to bring the kid up as our bullpen hasn't been exactly solid this year. Let's wish the kid success here in the MLB and hope that he will make his debut against the White Sox this weekend. Congratulations Stephen Pryor and welcome to the Mariners!! !